Employment Services and Support Family Child Care program graduate, Evangeline Sampson. Nine women from around the world gathered one last time, sculpting bright chunks of Play-Doh into physical representations of their time in UFV’s Employment Services and Support Family Child Care program. But the woman who travelled the shortest distance had, in a way, come the furthest. Evangeline Sampson started the 11-week program as a painfully shy high-school dropout single mother who recently moved from Terrace with three daughters in tow. She made a shooting star. “We’re not living in the dark anymore,” she says. Funded by the government of Canada through the Canada-British Columbia Job Fund Agreement, the purpose of the ESS Program is to increase labour market participation of British Columbians by assisting them to prepare for entry to, or return to, sustainable employment. 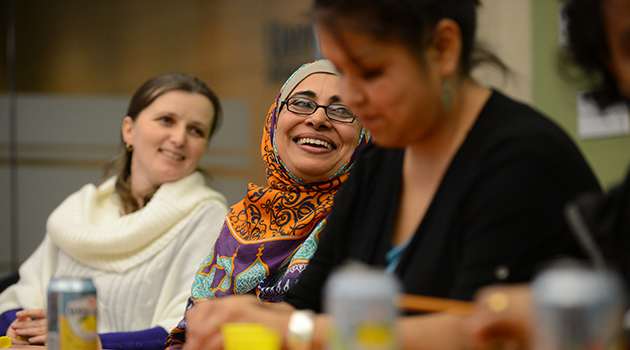 The ESS Family Child Care program at UFV covered textbooks, tuition, and other necessary costs to help provide Canadian child care credentials to immigrant, visible minority, and aboriginal women. Courses in the certificate program were outside of what UFV offers in other Continuing Education Family Child Care classes. They included: Understanding Child Behaviour; Health, Safety and Nutrition; WHMIS; First Aid; Planning Children’s Experiences; and Administration and working with Families. The daytime classes complemented 105-hour practicums. “The goal is to get these women in the workforce in the field of child care,” explains UFV Continuing Education Coordinator Ashley Klaassen, who provided monthly reports for the ministry. Evangeline’s journey was motivated by a desire to inspire her daughters, all living with her at Abbotsford’s Christine Lamb Residence, a supported second-stage housing complex for women and children needing a safe, affordable, and supported place to live. “We struggled coming down here, but we made it,” she says. Partway through the program, Evangeline’s confidence and commitment wavered. She started having doubts about graduating and turned to Ashley for advice. They talked, then watched UFV’s 2014 convocation video on YouTube. Evangeline pushed on, finishing with a 92-per-cent average. 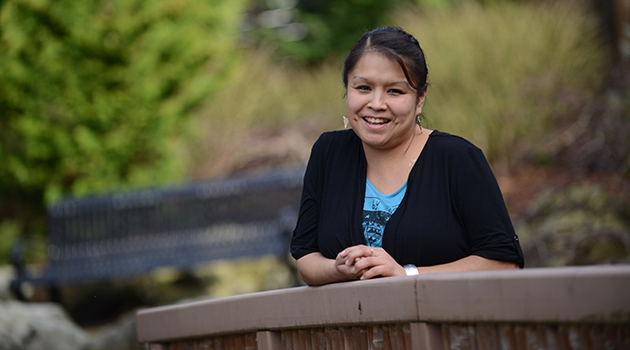 “I’m very thankful this was offered, and for all the support from UFV,” Evangeline says. Her daughters, ages 15, 13, and 6, will be there when Evangeline crosses UFV’s convocation stage this June. “We’re incredibly happy and proud of her,” Ashley says. The lessons learned through UFV’s Family Child Care program will hopefully land Evangeline permanent daycare employment, but they’ll also apply to her everyday life. “I learned to speak to children so it’s fair to them, but also firm. It’s important we find a way to understand each other,” she says.